I couldn’t get them to budge on that, but they invited me back to see the installation for myself during their dress rehearsals. So on Wednesday I headed to the Walker with a photographer to watch some experimenting. I was nervous as we walked into the Walker. Bieringa had told me that when she performed these experiments last year, people danced with her, cried, or even didn’t see her for a long time in the darkness. None of these reactions sounded like something I would enjoy. It turned out I was getting off easy: when I met up with Bieringa and Ramstad they told me that the photographer and I wouldn’t be inside the gallery alone. Instead, one of the other performers, Jeffery Haas, was acting as the audience and I was able to watch from the sidelines. Haas is an older man, and he sports quite a different build than the young, sinewy performer Justin Jones. I hadn’t realized that he was another performer until we were interduced. 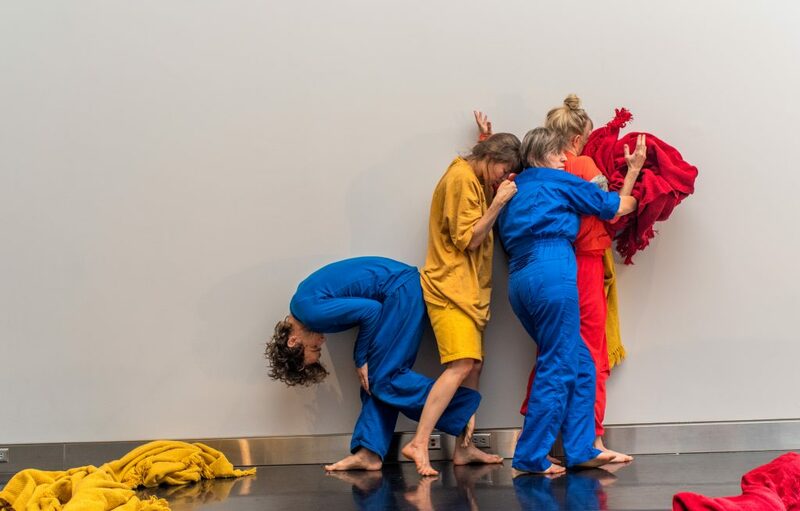 At first I was concerned that because a performer from the installation was also playing the part of the audience member, I wouldn’t see a dress rehearsal that really reflected the way these experiments would work, but Haas told me that he had no idea what Jones, would do because they had rehearsed more or less individually. Like me, Haas had no idea if Jones was going to try to dance with him, or make him cry, just that they were going to interact. When we first walked into the dark gallery, Jones wasn’t even doing that. The gallery was dark, and Jones was pacing back and forth as well as he could in the small space afforded to him. I had expected to enter one of the Walker’s larger galleries, but the space was only 13.5 feet wide and 16.5 feet deep. I shuffled into a corner and Haas stayed put by the door. Jones kept pacing in tighter and tighter loops as I got comfortable in my dark corner. Haas didn’t make eye contact, but stared as Jones’ pacing eventually turned into manic, spinning jumps. Jones was throwing himself around the room, as if a string in his chest was jerking him around. Haas stayed put by the door but Jones came pretty close to hitting me a couple of times. I thought I was getting off easy by not taking on the audience role, but I got nervous that Jones was going to crash into me and relocated to another corner, away from his thrashing. After a while Jones collapsed on the floor in the corner I had been occupying. By now, Haas had worked his way further into the room but was hugging the wall. He seemed nervous, and like he was genuinely trying to figure out what Jones was doing. The lights were getting brighter. Jones looked up at Haas from the floor and began dragging his body towards him. Haas stood stock still, avoiding eye contact, and inched out of Jones’ reach. The lights were bright by now and I was beginning to feel uncomfortable. “You’d think the bright lights would make you feel more comfortable, but you actually feel pretty naked,” Jones said later. Although he wasn’t crawling towards my feet, the bright light filling the tiny gallery was making me feel implicated in the performance more than I would have liked. After Jones’ crawling had pushed Haas nearly all the way into a corner, he suddenly jumped up and ran to the opposite wall. Edging along it as Haas and I were until he was close to Haas again. Jones had a look on his face like he was hiding from someone, and he was breathing heavily. When he was near the door, about six feet from Haas, the two make eye contact for the first time. Jones desperately reached his hand out to Haas, and Haas stared back at him. They stood like that for at least thirty seconds before Haas hesitantly brought his hand up. Jones kept his feet planted but leaned as far as he could along the wall, trying to brush his fingertips against Haas’. Haas wouldn’t fully extend his arm; he looked nervous to touch Jones. I would have been too. Finally, they made contact but after a few seconds Jones was gone, jumping around the gallery again. Some music, a droning buzz, was welling up. Haas and I both shuffled out of the way of Jones’ violent dance. Finally, after several minutes Jones fell facedown in the middle of the gallery, out of breath. As he was lying there Haas moved towards him, as if to provide some comfort. He knelt on the floor to get a better look at Jones but after a couple of minutes Jones began taking quicker, shallower breaths until I thought I was going to hyperventilate. Haas’ eyes widened but he didn’t back away. Soon after that, Jones began breathing so hard that he was thrashing up and down. The breaths were huge, melodramatic, and animalistic. Haas stayed close, and I was getting freaked out. This kept on for another minute, and I felt like I was beginning to understand the kind of empathy Bieringa and Ramstad had told me they were trying to create. Finally, Jones’ breathing subsided, and he turned towards Haas, resting his head in his hand. Haas paused for a beat, and then moved into the same position. This is the only time, for me, when I thought Haas’ behavior stretched what I would have done as an audience member. They stared at each other for a long time before another woman wordlessly opened up a curtain and we walked out, stepping over Jones. Every performance will be different, but my experience in the “Super Nature” installation was uncomfortable and at times nerve-wracking. 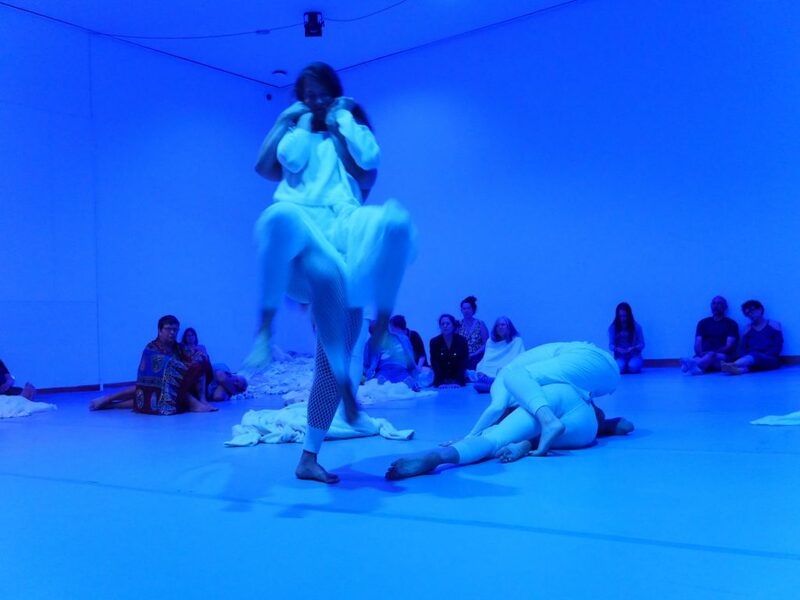 The performance Jones put on was strangely beautiful, and although I wasn’t implicated in the performance quite the same way another audience member would be, I saw the exchange of movement and emotion that can take place in these one-on-one experiments. It was difficult to step into that dark, tiny gallery for the “Super Nature” installation, but for all involved, the experience was rewarding. Knowing that my participation would go on to shape the choreography for the full “Super Nature” show in October made it that much better.